Florida residents were among father-daughter tennis players from across the U.S. claiming the coveted USTA Gold, Silver and Bronze ball trophies during the USTA National Father-Daughter & Sr./Super Sr./Ultra Sr. Father-Daughter Clay Court Championships, held Nov. 4-6, 2011, at the Jupiter Ocean & Racquet Club in Jupiter, Fla. The tournament featured four different divisions based on the father's age: Open (under 60), Senior (60 & over), Super Sr. (70 & over) and Ultra Sr. (80 & over). Division winners received the coveted USTA Gold Ball trophy, while runners-up receive the Silver Ball, and the 3rd/4th place playoff winners receive the Bronze Ball. 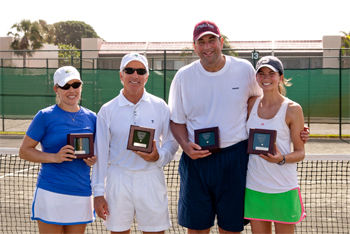 "The tournament originated at Jupiter Ocean and Racquet Club in 1997," said tournament supporter Amy Uzdilla. "This past weekend was another successful year with 94 players and their families coming to Jupiter. Nineteen different states were represented from California to Texas to Massachusetts. There is a request for a 90 and over division, which may be piloted next year." Jupiter Ocean & Racquet Club owner Bob Perrin and daughter Michelle won the USTA Bronze Ball in the Super Sr. Father-Daughter division, in the 3rd/4th place final defeating Eric Ellis of Stuart, Fla., and Barbara Ellis of Woodbridge, Conn., 6-4, 6-7(1), 7-6(2). "Bob now has won a coveted ball, Gold, Silver and Bronze, with all three of his children," Uzdilla said. "We would also like to thank all the volunteers and local businesses for their support during the tournament." Florida residents captured USTA Silver Ball trophies in the Open and Super Sr. divisions. In the Open final No. 2 seeds Jerry Morse-Karzen/Becky Morse-Karzen of Wilmette, Ill., defeated top seeds William Disesa/Blair Henley of Palm Beach Gardens, Fla., 6-4, 6-2. The Bronze Ball was won by No. 4 seeds Ben Testerman/Misha Testerman of Knoxville, Tenn., who defeated Stan Aranda/Alexis Aranda of Longwood, Fla., 6-1, 6-2. Ben Testerman is a former ATP player, reaching the semifinals of the 1984 Australian Open. In the Super Sr. final, No. 2 seeds Charles Joslin Jr. of Newbury, N.H., and Laura Joslin of Bradford, N.H. upset top seeds Julie Mitchell of Salon, Ohio, and Paul Walker of The Villages, Fla., 6-3, 7-6(4). In the Senior final, top seeds Al Baker/Marianne Baker of Glenelg, Md., won the Gold Ball, defeating David Martin/Ashley Martin of Barrington, Ill., 5-7, 7-5, 6-3. In the 3rd/4th place playoff William White/Stephanie White of Boston, Mass. topped Jim Cantrell of Greensboro, N.C., and Kelley Cantrell of Arlington, Va., 6-4, 2-6, 7-5. Top seeds Enver Mehmedbasich/Susan Wright of Grand Junction, Co., won the Gold Ball in the 80 and Over division, in the final defeating No. 2 seeds Ann Jacobs of Weston, Mass./Richard Phelps of Wakefield, Mass. 1-6, 7-6(4), 6-1. The Bronze Ball went to Rodolpho Suguitan of Bradenton, Fla., and Jodi Suguitan of Smyrna, Ga., who in the playoff defeated W.T. Mathes/Marcia Sentell of Johnson City, Tenn., 6-0, 6-2. For complete draws and results go to https://tennislink.usta.com/tournaments/tournamenthome/tournament.aspx?T=96​422. The Intercollegiate Tennis Association (ITA) is offering a special opportunity for USTA Florida members (who are NOT ITA members) to attend the 2011 ITA Coaches Convention in Naples, Fla., on Dec. 14-16, 2011. A special registration package includes 14 hours of coach education, with MaliVai Washington headlining a schedule of speakers who will present clinics. Registrants are eligible to receive a Certificate of Continuing Coach Education from the ITA. 2.) Scroll over "About the ITA"
4.) Click on "2011 Convention Details"